Man super cool day today. 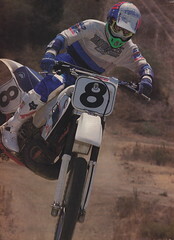 The fourth article I have written for PulpMX.com went up today and I have gotten a lot of positive feedback. The online editor of RacerX Illustrated Jason Wiegant even tweeted that it was “superb a must read”. Man I was so excited when I read that I could have walked on air. I have really been enjoying writing stuff for PulpMX. I have always loved writing since I was a kid but have never really applied myself to it or found a real outlet for it. When I was in high school I wanted to be an author but again I never followed through with it. I always figured I had no real chance of going anywhere with it so why even try. Well this whole article thing has gotten my creative juices going again. I so enjoy writing, it has even actually gotten me thinking about maybe taking another stab at writing some fiction again. In the mean time I hope to write a few more articles for PulpMX. It has already allowed me to talk to guys within the industry I would have never gotten to know otherwise. It is just cool to know guys I grew up idolizing actually know my name now and talk to me. It is a small thing but in life it is so often the small things that bring us the most joy. For now I am just enjoying the ride.